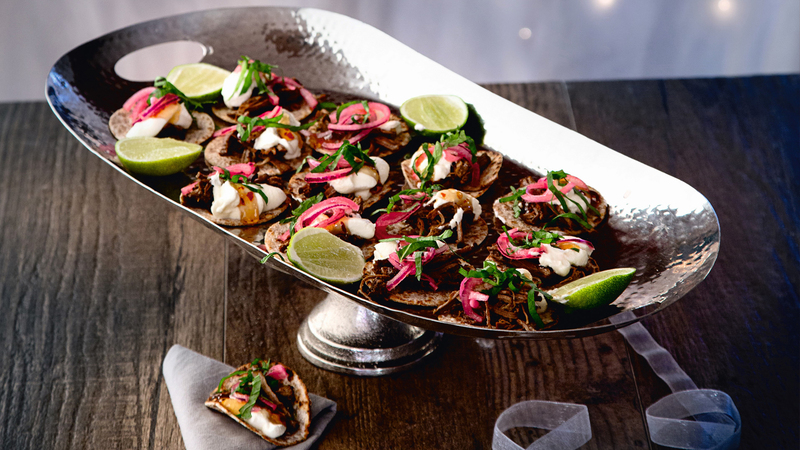 Clare has your party nibbles sorted with her moreish mini beef and lime tacos. 1. Cook the beef according to the packet instructions. Shred the cooked beef with two forks in the foil tray. 2. Juice the limes and pour it into a jam jar, then add the salt, screw the lid on tightly and shake to combine. Slice the onion into thin half-moons. Pack the slices into the jar until they are covered by the lime juice. Set aside to let the onion pickle in the lime juice. use a sharp knife to cut into thin ribbons. toast for 1 minute on each side. tortilla base. Top with crème fraîche, then add a small dollop of the chilli jelly. Add a little of the pickled red onion, then scatter over the shredded mint. Serve with lime wedges for squeezing over.